David Wheeler has urged MK Dons fans to remain patient and realistic during their recent run of poor form. 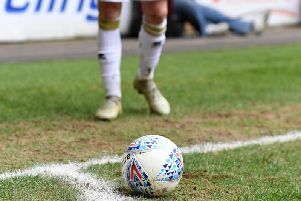 Winning just three of their last 10 games, Dons have slipped out of the automatic promotions spots to sixth in League 2, without a win on the road since November 3. Wheeler, who joined in January on loan from Queens Park Rangers, has made three appearances for Dons - two defeats and a win - but believes now is not the time to panic. He said: "We're in a much better position than plenty of other teams who had ambitions of being promoted. We're in genuine sight of automatic promotion which is more than most teams. I think there has to be confidence and belief. "I want to help the situation, and help improve the situation. It is never down to one individual, but the team being fluid and on the same page. It ebbs and flows during the season and we've had a bit of a dip. If we can time when it all clicks and get that right, heading into the last part of the season, that's ideal." Wheeler is no stranger to working with manager Paul Tisdale, having played under him at Exeter City before moving to Loftus Road. The 28-year-old is another is the growing list of players to have worked with Tisdale previously in the Dons dressing room, but said there was plenty more to his decision to join on loan than just reuniting with his old manager. "You come to the ground and the facilities are so impressive. Where the club has been in recent history is a big appeal. There is certainly more to it but he has been a big factor. Seeing the ambition of the club and ambition to get promoted is a big thing too, you want to come in and be a part of something." Wheeler did, however, admit working with Tisdale again has helped him get his feet under the table at Stadium MK smoothly. He continued "That's the beauty of coming back and playing for Tis – I played with him for four years, so I know what he wants from me, generally, and from his teams. It's good to have that history. "A lot of it is the mutual respect - the respect he has for his players as people, he treats you like people. You don't get messed about, you know where you are,m and he genuinely wants to see people improve and be successful. He makes you see the game in different ways, ways you don't necessarily look at it – taking into account how others play, how the opponents play – he's very good like that. "It's a really good group of lads and they have made it pretty easy, it has been a smooth transition. I feel relaxed and welcomed, I'm happy so far.